Franklin's A Minimal Libertarianism is an attempt to reconcile the scientific picture of ourselves as situated within the natural causal order, with the manifest picture of ourselves as having such control over our actions – or free will - as is required for moral responsibility and which underpins our practices of holding people morally accountable. This is to be achieved by: i) rejecting non-causal and agent-causal forms of libertarianism which seem to place humans outside the natural causal order ii) accepting agency reductionism, which reduces the causal role of the agent to the causal role of mental states and events involving that agent iii) rejecting theories that hold that free will is compatible with determinism, and iv) developing a minimal event-causal libertarianism which takes the best compatibilist theory of free will and moral responsibility and merely introduces indeterminism in the appropriate place, thereby delivering a robust and valuable kind of freedom and responsibility unavailable to compatibilists. This ambitious aim involves three projects: i) to show that determinism is incompatible with free will and moral responsibility ii) to explain the role and location of indeterminism in the theory, and iii) to show how the theory can solve the problems of luck and enhanced control which have previously created problems for indeterminist accounts. These projects take up the majority of the book, but the detailed and rigorous work on them is undertaken beneath two acknowledged shadows. The first is that no argument is given for the existence of indeterminism other than its role in replacing compatibilism with libertarianism. The second is that the agency reductionism which underpins the projects is itself brought into question in the final chapter. We shall consider the impact of these limitations later. Franklin begins the substantive work by developing a theory of moral responsibility which focuses on moral accountability, itself defined in terms of praise - and blameworthiness. Accepting Strawson's injunction to pay attention to our actual interpersonal practices of holding one another responsible, Franklin discusses three defences or pleas against charges of wrongdoing and formulates principles to explain the normative force of each one. The plea of justification is backed by the Principle of Wrongdoing, namely that an agent deserves blame for ψ-ing only if ψ-ing was morally wrong. While unexceptionable, this is not where the interest lies. The plea of exemption from moral accountability, grounded for example in insanity or extreme youth, is backed by the Principle of Normative Competence which states that an agent deserves blame for ψ-ing only if they were normatively competent. Normative competence in turn consists in a complex of cognitive abilities – the abilities of reflective self-control - including the grasp of moral concepts and the ability to apply them to a range of situations, and the volitional abilities to control and regulate one's behaviour in the light of moral reasons. Lastly, the normative force of pleas that consist in excuses is explained by the Principle of Reasonable Opportunity, namely that an agent deserves blame for ψ-ing only if they had a reasonable opportunity to avoid ψ-ing. Franklin holds that the theory of moral accountability so far is neutral between compatibilists and libertarians, and that the differences come with the analysis of abilities and opportunities. He holds that free will requires both the abilities which comprise normative competence and the opportunity to exercise them in more than one way (minimally, to ψ or not to ψ). It is this opportunity to do otherwise that is said to be incompatible with determinism, since determinism entails that there are 'decisive obstacles' to every agent's doing otherwise. It is in this discussion that tensions appear between the metaphysical role of the concepts of opportunity, ability and decisive obstacle, and their role in actual moral practice. Taking ability, Franklin adopts a general capacity view which takes abilities as relatively stable over time, grounded in the intrinsic properties of the agent, persisting through periods of sleep and inactivity, and in situations where they cannot be exercised (Anne has the ability to play a grand piano even when flying on a piano-less airplane). Now take the case of David, in the grip of an irresistible addictive desire, who breaks a promise to return books to a friend in order to make a drug deal. Franklin argues that any defence against blame here cannot be based on being exempt from responsibility, due to a temporary lack of the ability to regulate his behaviour in the light of moral reasoning which forms a key component of normative competence, since this ability is understood as a general capacity not subject to such 'wild fluctuations'. Instead, the plea of addiction should be understood as an excuse: the addictive desire deprives David of the reasonable opportunity to return the books ('addiction is the mental analogue of physical constraint'). This seems odd: actual moral practice might well suggest that David has the opportunity to return the books (he has a car, and the ability to drive it), but is unable to conquer the irresistible desire (it is, as Franklin stresses, irresistible after all). He is, we might say, not himself when in the grip of such desires, and when they fade or are satisfied his normal ability to regulate his behaviour returns. Such a response would distinguish between the nature of the high-order ability to regulate behaviour and more specific abilities such as playing the piano or driving a car, but this does not seem implausible. However, it is the metaphysical role of these concepts which is crucial to this book and to which we now turn. An agent S performed a directly free action ψ at time t iff S possessed and exercised at t some of the abilities of reflective self-control with respect to ψ and S had the opportunity at t both to ψ and not to ψ. Opportunity*: S has the opportunity to ψ at time t in possible world W iff there is a possible world W* in which S ψs at t, and, at the very least, everything except S's ψ-ing, and any event that depends on S's ψ-ing are the same as in W.
Thus for Franklin (p.84): 'an agent has the opportunity to ψ just in case there is no decisive obstacle to his ψ-ing, where an obstacle to his ψ-ing is decisive just in case the agent's ψ-ing would require a change in the world that is neither identical to nor dependent on the agent's ψ-ing'. His No Opportunity Argument (p.72) has thereby shown that 'determinism is incompatible with the opportunity to do otherwise [and consequently free will and moral responsibility]: determinism entails that there are decisive obstacles to every agent's doing otherwise'. Here again there are tensions: the analysis of opportunity seems at odds with the possibility of the agent's being responsible, through previous action or inaction, for the absence of a current opportunity – a 'tracing issue' which Franklin acknowledges (p.43 note 24) features in actual moral discourse. Furthermore, our ordinary talk of obstacles, whether in the form of positive obstruction or absence of the appropriate environment, is related to specific contexts and options for their removal, and the extent to which we hold people responsible for at least trying to overcome them. To speak of decisive obstacles in the plural entailed by determinism is misleading: there is just the one insuperable metaphysical obstacle to anyone doing anything otherwise. (This may to some extent be an example of the potential that possible world analyses of ordinary concepts have to detach those concepts from actual discourse). Minimal event-causal libertarianism: An agent s's action ψ at time t was directly free and one he was directly morally responsible for iff (i) S was normatively responsible with respect to ψ at t, (ii) ψ was a basic action, (iii) S's reasons that favored ψ nondeviantly brought about ψ at t, and (iv) it was possible, given the past and laws of nature up until t, that R not have caused ψ. [Directly free: An action is directly free if and only if its freedom is not derived from another free action.] [In this and other formulations, 'R' is not made explicit but seems to refer to the complex of beliefs and desires that constitute the agent's reasons]. The following two chapters take up Franklin's third project, namely to show how this model deals with the problems of luck and enhanced control. Franklin traces the problem of luck back to Hobbes, Locke and Hume: if an action is undetermined, then it is a matter of luck; if an action is a matter of luck, then it is not free. Franklin then discusses four formulations of the argument: i) that indeterminism implies lack of causation, ii) that if an action is undetermined then no agent can ensure that it will happen, iii) the Rollback formulation, relying on the notion of objective probability in a replay of events, and iv) that luck is introduced due to a lack of contrastive explanation of action. This is a tightly argued chapter and while there may be other versions of the Luck Argument Franklin gives good reasons to show that his location of indeterminism at the moment of basic action (in addition to other arguments) can disarm its strongest formulations. He also notes (p.123 note 5) that his arguments can be endorsed by agent-causal libertarians, and this parallel resurfaces in dealing with the problem of Enhanced Control. Even if the Luck Argument can be laid to rest, minimal event-causal libertarianism faces another challenge. Franklin's libertarianism differs from compatibilism only in requiring that directly free action be undetermined: how then can it secure more control than compatibilism, and enough control to provide free will? He begins by arguing that insofar as agent-causal libertarianism differs from agent-causal compatibilism only in requiring indeterminism, it faces the same challenge as event-causal libertarianism. The solution to the challenge, which can also be endorsed by agent-causal libertarians, is that appropriately located indeterminism presents us with the opportunity – not just the ability - to do otherwise: we have, minimally, the opportunity to ψ or to refrain from ψ-ing which is denied to the agent under compatibilism. But this seems a very attenuated form of control. Agents with the opportunities provided for by minimal event-causal libertarianism may thereby have more control – the opportunity to do otherwise is presented to them – but it is unclear under agency-reductionism, where the causal role of agents is reducible to the causal activities of mental states and events involving the agent, in what sense it is 'up to them to determine or settle what they do' (p.169) and thereby exercise that control. It is at this point that Franklin completes his third project and turns to agency-reductionism itself. In his last main chapter Franklin builds on his critique of Pereboom's Disappearing Agent Argument (to the effect that only if agents are irreducibly causally involved in the production of their decisions do they have the power to settle which decisions they make) to present his own It Ain't Me Argument which questions agency-reductionism in the light of two thoughts. First, that agents are not identical to their 'desires, cares, intentions, policies, beliefs and so forth'; and second, that when an agent performs a self-determined action, their causal contribution is something over and above the causal contribution of their motivations. If agency-reductionism holds 'it ain't me' that causes my decision: the agent is excluded from causal relevance. Franklin offers potential responses to the argument, which involve rejecting either of the two thoughts above, or denying that self-determination is necessary for free will, and points to their shortcomings. He further holds that It Ain't Me works against both event-causal libertarianism and event-causal compatibilism, and points to more work to be done to assess the ultimate tenability of event-causal libertarianism. Where should this take us? Event-causal libertarians (and compatibilists) may respond directly to the It Ain't Me Argument, but Franklin seems to side with the manifest image of ourselves as sources of activity over and above the activity of our mental states. As far as indeterminism is concerned, Franklin says that a separate book would be required to explore any empirical support for it, and that if libertarianism requires strong scientific evidence for indeterminism then libertarianism is in trouble. For their part agent-causal libertarians may seem to fly in the face of the scientific image of the person, but the practice of science itself seems to presuppose the existence of self-determined action on the part of scientists, and it may be that scientific image itself which should be put in question. 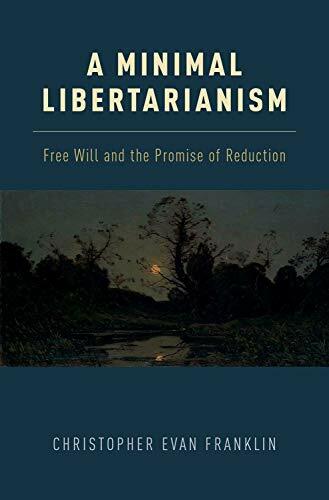 In the light of these issues Franklin's achievement is to have produced a robust and closely-argued case for perhaps the simplest event-causal libertarianism available, and thereby pointed up the potential limitations of all event-causal theories of free will. The book is fully engaged with current work in the area and is a valuable addition to it.